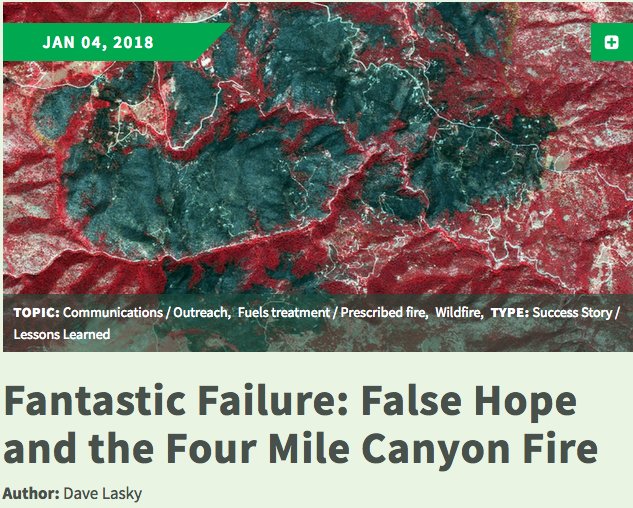 Here is a great blog post on the Fire Adapted Communities Learning Network website about lessons learned from the 2010 Four Mile Canyon fire near Boulder, CO. The author, Dave Lasky of Gravitas Peak Wildland Fire Module, personally treated 600 acres of forest within the burn scar prior to the burn. The blog post highlights the importance of following up mechanical treatments with prescribed fire to reduce surface fuels. The post also discusses how home construction, weather, and other factors often play a much larger role than vegetation in determining fire behavior and fire impacts to communities. Older PostIndonesian Foresters Visit the Zuni Mountains!